I’ve found new information on the Dayton portable. First, from advertisements and one article, it appears the Dayton was offered originally in black, and then in battleship gray to appease dissatisfied customers. Apparently some felt the black Dayton was ugly (I suspect, though, that people found the whole machine ugly). 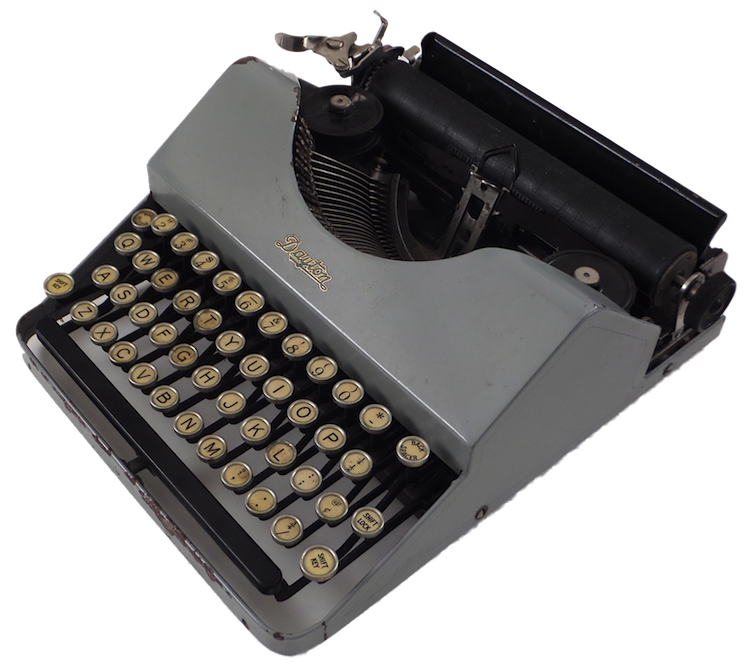 Second, it appears the typewriter had to be ordered, that machines may not have been sold from existing inventories. 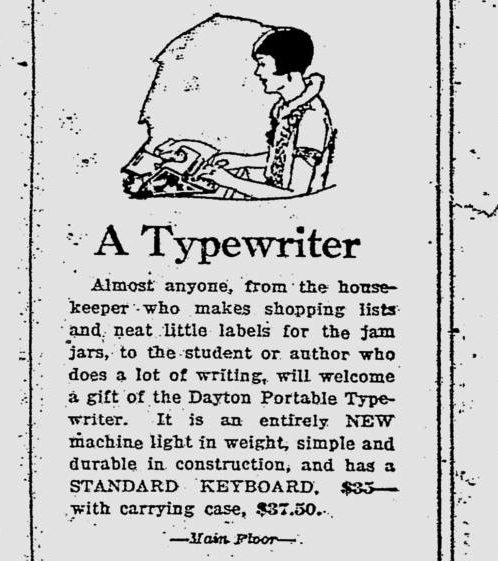 Third, judging from the fact that the only known advertising for the Dayton was placed in November and December of 1924, it’s possible the typewriter was sold well into 1925. 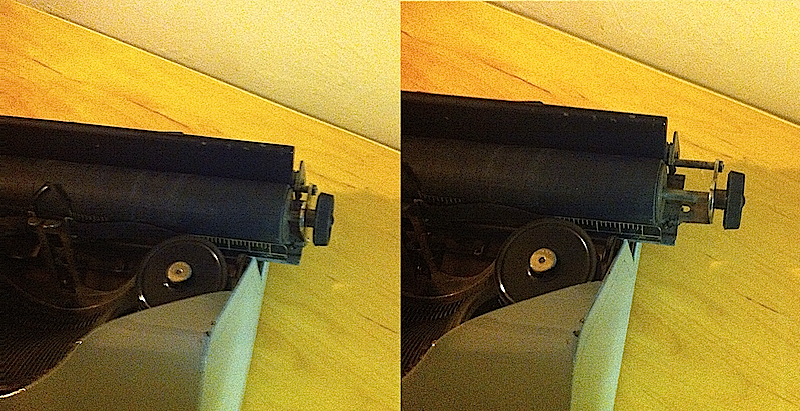 One other interesting note: the right platen-knob was, in fact, designed to extend and retract to accommodate envelopes. I had previously “vlogged” about that mysterious feature here, not understanding its purpose. The Dayton typewriter company manufactured only a few hundred of these machines — only seven can be found in collections today — and the company did not endure much beyond 1925. There are probably many reasons for Dayton’s failure, but it appears that the machine was not popular with women. At first glance, it seems strange the author would employ the Dayton typewriter company as a model of effective marketing — after all, the company failed — but that misses the point. Dayton, apparently, did not fail to respond to consumer demands. Despite adopting an extreme design principle of simplicity — a factor that cut the cost of the machine — the company could be flexible. Very flexible? Perhaps not. “Neutral gray” is a pale compromise. Interestingly, of the seven known Daytons, six are grey. One is black. It may be that Dayton sold more of the grey variety, but, in any case, the company never sold enough of either. That women made up a majority of Dayton’s customers is not surprising. The machine appears to have been sold principally at retail outlets, where home merchandise predominated, not office supply stores. The Dayton does not easily harmonize with home fixtures. Considering that most home appliances were designed with consumers’ aesthetic sensibilities in mind, the stark Dayton could not have won many customers. This alteration was likely made in 1925. This is likely. In advertising (see below) none mentions that the Dayton could be had in grey too. To note, all existing Daytons have this logo, even the black model (see here). It should be stated that if women were indeed the principal customers, the color of the machine could not have been the main concern. The Dayton is one ugly beast, totally lacking in elegance. 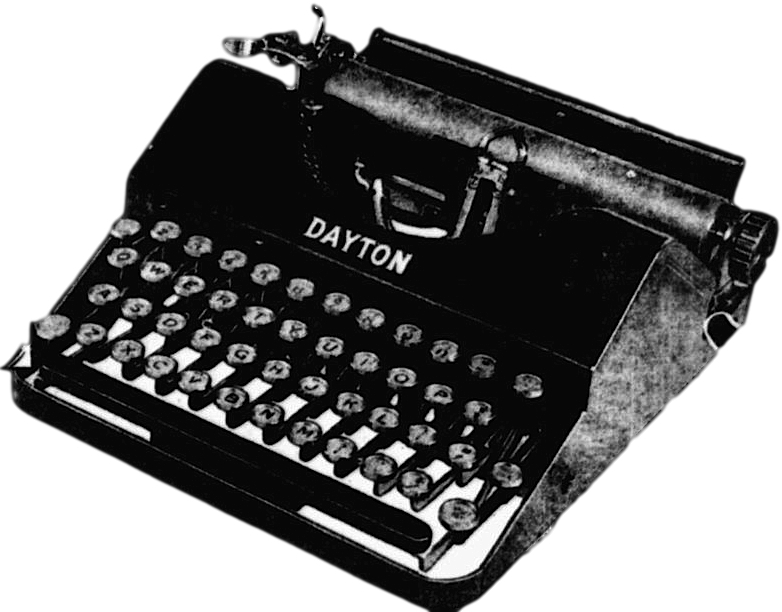 Compared to a Royal or Underwood (or nearly any other portable), eye appeal was never the Dayton’s strength, which is sad, because the Dayton was a nice machine. I suspect another reason for the Dayton’s failure was that too few were ever produced. While other manufacturers were producing 1,000 or more portables per month, Dayton seems never to have made more than 30 or so a month. A tight product supply could not have been good for sales. An advertisement placed in the Pittsburgh Press, Dec. 1, reads, “Reservations should be made promptly, because the factory at present time is having difficulty in keeping up with the orders for Christmas delivery.” It’s likely the advertiser wanted to give the impression that the Dayton was in high demand, but it probably left the customer wondering why the company didn’t have enough supply on hand — especially during the Christmas season! This leads to another question: where was the Dayton sold? One would reasonably expect that it was sold in Dayton, Ohio, but perhaps not. The only advertising I’ve found for it was placed in Pittsburgh-area newspapers by Joseph Horne, a large retailer. Not having agents, I suspect Dayton’s strategy was to sell a limited supply in large markets. Perhaps the company found only one retailer. Joseph Horne placed at least three large ads for the Dayton, which was evidently part of a campaign. In the first two ads, Joseph Horne “presents” and “announces” the Dayton, suggesting the machine was introduced to consumers late in 1924. A fourth, smaller ad, is dated Dec. 16. 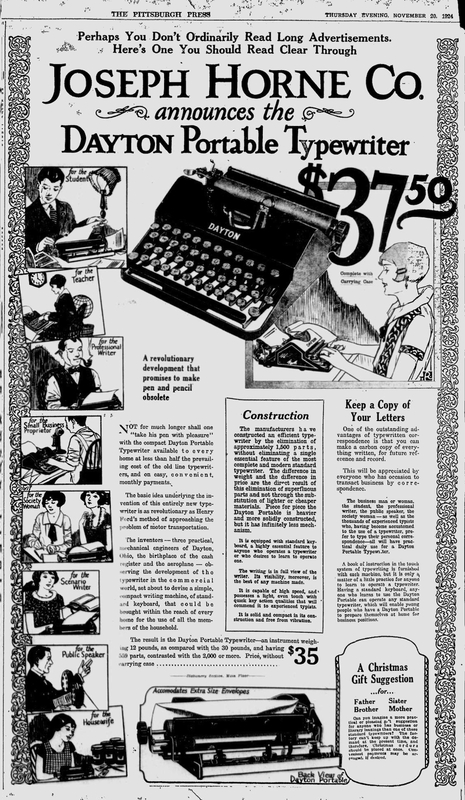 Unless Dayton abruptly halted production, the typewriter was sold (and manufactured) well into 1925, perhaps even into 1926 when the article in The Poster was published. This, however, is pure conjecture. Not every newspaper has been digitally archived, which is the principal source for information here. A short while ago, I noticed the right knob on my Dayton could be extended, but I didn’t understand why. To enlarge images, right-click and open in a new tab. The Pittsburgh Press – Nov. 20, 1924. Note that the Dayton at the top of the ad is a photograph. Also note that the Dayton is portrayed as domestic product. See newspaper here. The Pittsburgh Press, Dec. 1, 1924. According to this ad, the Dayton was purchased by order, not stock on hand. Also note that unlike the previous ad, this one features more men. See newspaper here. 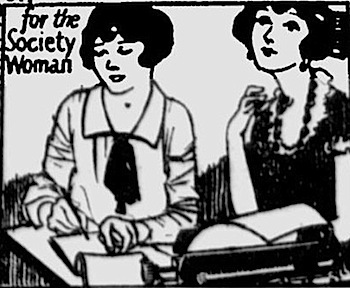 Pittsburgh Press, Dec. 15, 1924. This is the ad I displayed in my original post on the Dayton portable (here). See newspaper here. The Gazette Times (Pittsburgh) – Dec. 16, 1924, placed by Joseph Horne. Note that the Dayton is decidedly a product for the home. See newspaper here. Interesting post. Would love to find one of these!